This wind is driving me crazy! 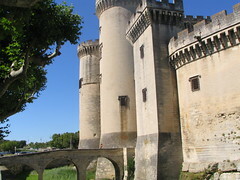 I left Avignon late because the wind was so strong and I did not want to leave my tent. 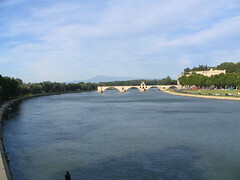 I went over to the Pont d’Avignon, but didn’t want to pay 4.50 euros to walk on a bridge that doesn’t even go all the way across the river. 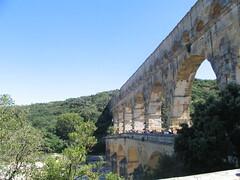 I left Avignon and headed to the Pont du Gard. The wind was still really strong. I think this is the oldest Roman bridge/aqueduct in the world. Heading away from the Pont du Gard, the Mistral was at my back. It was nice to have a break from battling a headwind. 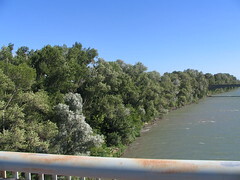 I was crossing a bridge, with plans to go to Arles, but the wind was so strong. I had to get off my bike and walk it, downhill, because it was blowing me around and I was afraid I would get blown into traffic. When I saw a sign for camping on the other side of the bridge, I decided to stop in Tarascon. It was a cool city, and I camped right next to a castle. The wind was so strong through the night and I had a really hard time sleeping. I was a little worried my tent would get blown away, but it was fine and everything was still there in the morning. Supposedly the Mistral drove Vincent Van Gogh mad, which led him to cut off his ear. (I thought it was another reason.) 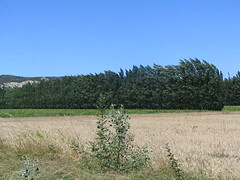 This fierce wind is continuou,s lasting for days; can be up to 100kph(62mph); dries the skin & cracks lips;chills your bones; develops as a cold front moving down across France, piles up in the Alps before spilling over the mtn’s top and rushing down into the Rhone valley bet. the Alps and Cevenes. Good part=contributes to growing the best grapes. Okay, I say that makes it all worth while. keep your ears on, heather!